The NCAA tournament has long been considered an excellent stage for college basketball players to show they can thrive under the bright lights. The 2016 dance has been no exception. In the first weekend of March Madness, we had a handful of players unleash memorable performances. Some of these individuals may have even improved their draft stock. And honestly, when you really think about it, that is the point. Just ask Oklahoma City’s Russell Westbrook. During the 2008 NCAA tournament, Stephen Curry, now arguably the face of the NBA, put on a show that catapulted him into the national spotlight. However, he wasn’t the only future superstar to do so. A young Westbrook, then a sophomore with the UCLA Bruins, provided the world with a small taste of what he could become. With these three performances, the future NBA All-Star went from a prospect with potential to a genuine household name. Despite taking a 41-20 lead into halftime of their Sweet 16 showdown, the No. 1-seeded UCLA Bruins were seriously challenged by the 12th-seeded Western Kentucky Hilltoppers in the second frame. And while freshman Kevin Love might have been UCLA’s leading scorer with 29 points, it was Westbrook who truly showed his overall value and versatility. Although he only shot three of 15 from the field, including one of two from three-point land, No. 0 went seven for eight from the free throw line, pulled down 11 rebounds (five of them offensive), and added five assists and one steal. The Bruins would escape their West regional semifinal game with a 88-78 victory. As for Westbrook’s stellar play, there was plenty more where that came from. The Xavier Muskateers came into the Elite Eight as the No. 3 seed in the West Region and winners of 30 games that season. This was a group that should’ve been able to give UCLA a run for its money. Unfortunately for them, it didn’t work out that way. The Bruins had too much Westbrook going for them. Unlike the previous game. this time around the sophomore standout was plenty efficient from the field. Westbrook knocked down seven of 11 shots, went one for three from beyond the three-point line, and hit two of three freebies. He would finish the game with 17 points, three rebounds, three assists, and three steals, and UCLA would advance to its second consecutive Final Four with a convincing 76-57 victory. For the second straight year, UCLA’s tournament run would end in the national semifinal. As talented as the Bruins were, they were simply no match for the John Calipari-led Memphis Tigers. And while the 2007-08 season would end in disappointment, the Final Four was the perfect stage for Westbrook to have arguably the best game of his college career. 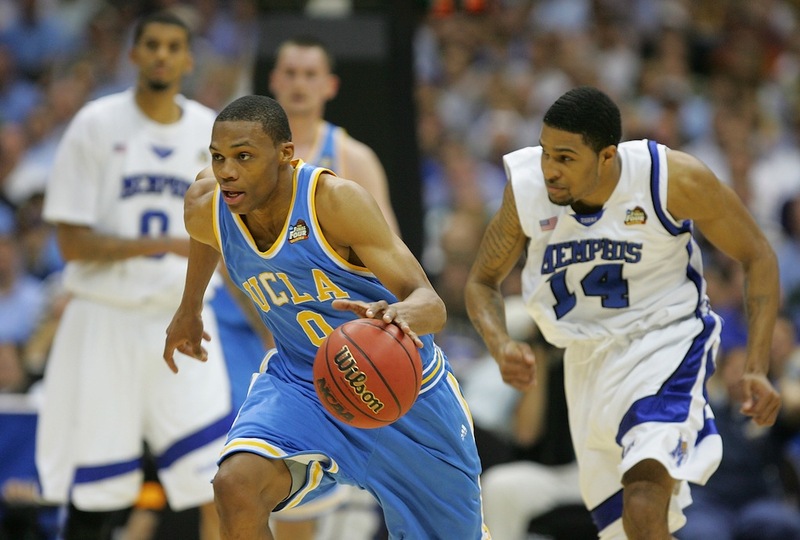 With all eyes on Memphis’s Derrick Rose, it was UCLA’s young guard who proved he had the chops to play with anyone. Westbrook went 10 for 19 from the field, knocked down two of three from beyond the arc, and finished the game with 22 points, three rebounds, two assists, and two steals. His combination of athleticism, explosiveness, raw physical gifts, and untapped potential were on full display. It was at this moment that everyone began to realize just how special a player Westbrook was. Obviously he’s lived up to those expectations since, as the Oklahoma City Thunder have been perennial contenders in a stacked Western Conference. Statistics courtesy of SR/College Basketball.